Young adult literary adaptations have become as much a genre to themselves as the super hero or comic book movie. They exist in a vacuum where many of the same rules apply to the different worlds being brought to life. As of late, and meaning after the breakthrough of Harry Potter, the solidification of Twilight and the confirmation of not simply being a fad by The Hunger Games, we have received several female-led, dystopian-set tales of rebellion and individualism that employ fantastical creatures and environments to communicate their bigger themes to the youth of today. In all honesty, I've enjoyed a great deal of them for either their tone (Beautiful Creatures) or extent of creativity (Divergent) while others have been downright terrible (Mortal Instruments). While it may be easy to spot a YA adaptation from a mile away these days it doesn't mean the trend is fading, in fact it is the opposite, for if anything it feels these types of titles are just ramping-up in the way that studios have finally found solid ground on which to build these series hopefuls. It is in the same vein that it took Marvel nearly a decade to establish their own cinematic universe after the X-Men hit the screen for the first time, but now that wehave a type of blueprint things are moving much faster. No matter the eventual box office return, the feature adaptation of a popular teen-lit series can't presently be labeled as a bad idea and thus we have been brought The Maze Runner. Based on a series of four books (which, if successful, will eventually mean five movies) by James Dashner this is the first real departure for the genre since becoming an institution that deviates from the formula of female lead in a failing, dystopian societal structure. Instead, what we are given is a very stripped down, human survival story with plenty of mystery surrounding the circumstances to keep audiences intrigued as our host of characters slowly peel back layers of the secrets within twisting both our expectations and hopes while consistently keeping us engaged in its proceedings. It is as much an accomplishment as any non-branded, non-sequel movie to hit theaters these days and become a hit as it is for the first installment of a YA adaptation to stand completely on its own while still setting itself up for more stories and if The Maze Runner has a single great strength, that is it. when they come under attack by the mysterious Grievers. Thrust right into the middle of the action we awake with Thomas (Dylan O'Brien) as he rises in an old, rusty elevator to the middle of what is referred to as "The Glade." As the doors to the elevator opens above him he is surrounded by a large group of young men and realizes he has no memory of who he is or what his life consisted of before this point. He is brought to the surface quick and introduced to the leaders of the pack that include alpha male Alby (Aml Ameen), stubborn Gally (Will Poulter) and the reserved, but wise Newt (Thomas Brodie-Sangster). While Alby talks and informs as well as answers some of the many questions flooding Thomas' mind it becomes clear Gally is not one to make friends easy and Newt is slightly hesitant, but optimistic of the skill their new recruit possesses. We learn that a new person comes up in the elevator with supplies once a month and that this has been happening for three years. We also learn that "The Glade" is surrounded by massive walls that encase the young men and that there is seemingly no way out. Thomas isn't one to take others at their word though and so he begins to investigate for himself, quickly making friends with Chuck (Blake Cooper) from whom he learns the walls are not just walls, but the threshold to a maze that has yet to be cracked. Besides the labyrinthine challenge that stands between them and their escape this colony of young men have all the while been working to establish a functioning society. Things begin to take a turn for the really strange just after Thomas arrives with attacks from the "Grievers" or creatures that dwell within the maze becoming more frequent. Even weirder is that these attacks are occurring in broad daylight when the maze is usually open and poses no threat. That the maze is open during this time allows for who the boys of "The Glade" have labeled as "runners" to venture out and do their best to map what they've seen. 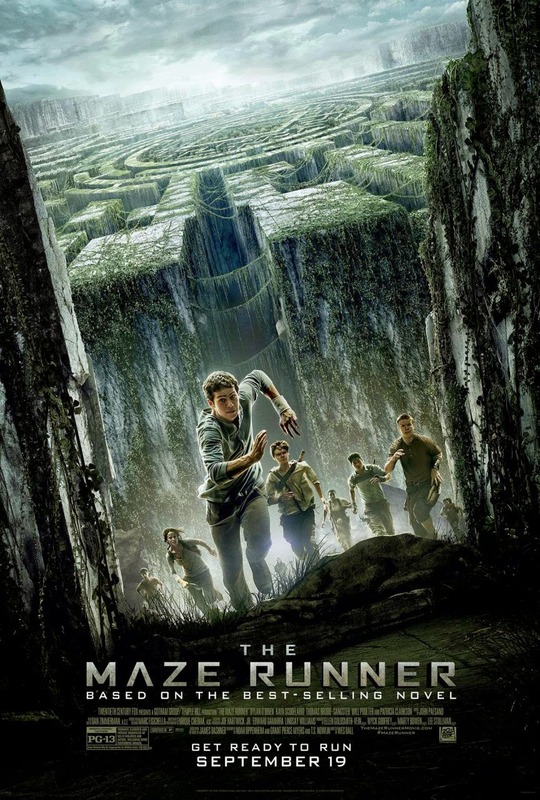 No one has ever survived a night in the maze, that is until lead "runner" Minho (Ki Hong Lee), doesn't make it back before sundown and Thomas voluntarily runs into the maze not to be a hero, but to get some real answers rather than sitting around waiting for them to come to him. In a fair number of these young adult novels turned potential movie franchises the problems begin in the casting department where models are expected to bring depth and insight to characters who care little about their looks or their perceived attitude, but are more focused on the goal at hand. While I have my minor complaints about some of the stylistic choices here (Lee's hair is so perfected it is distracting when he's supposedly gone nearly three years without a proper haircut nevermind the lack of product) though what becomes all the more pleasing as the film gets deeper into its characterizations is the lack of any inhibition by its main cast and rather the pure dedication to the content at hand allowing audiences to accept it with a strong sense of sincerity. I've only seen O'Brien previously in last summers The Internship, but here he proves to be a valid leading presence in that he not only delivers dialogue that could be predicted four scenes ahead of its arrival with some kind of gravitas, but also in the fact that we immediately buy into his strength and confidence as a leader. 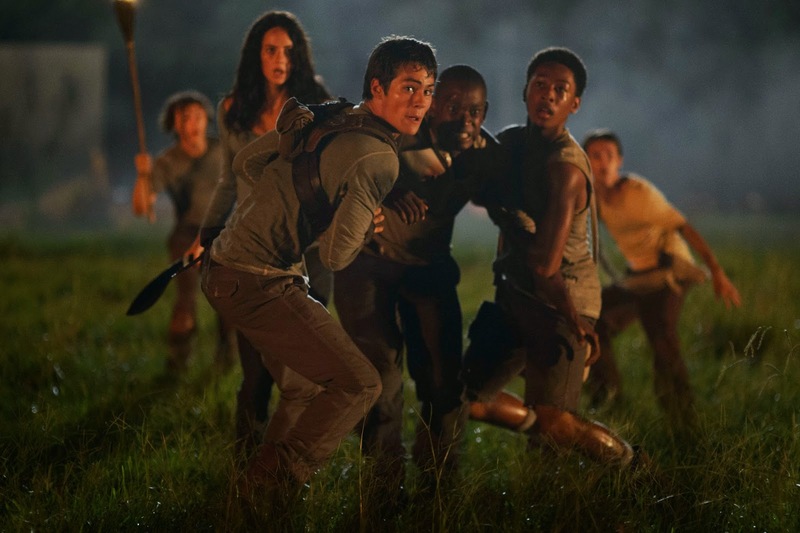 Thomas is thrown into the world of "The Glade" with no preparation and no idea what he is doing, but he is so strong-willed it takes him only a matter of days to start making waves. To accomplish this, one must have a certain air about them and luckily O'Brien possesses that necessary conviction while never allowing it to be seen as cocky which would then derail the whole idea of who this character is and what he stands for. O'Brien, Poulter and Brodie-Sangster do the majority of the heavy lifting here and despite the fact it is hard to take Poulter seriously as the bully of the group he is actually rather intimidating while showing some true vulnerability when his fears of not staying tucked away in this alternate reality are disrupted by Thomas. There is also the arrival of the sole female into this equation, Teresa (Kaya Scodelario), whom not much is made about and who I assume will play a much larger part in the continued storyline, but does bring up another small qualm. To punish Thomas for the rules he's broken Gally, at one point, wants to sacrifice him and Teresa to the Grievers and you're telling me every single one of those guys is cool with doing away with the only girl they've seen in three years? Right. I would love to see the deleted scene where these guys point out the obvious. 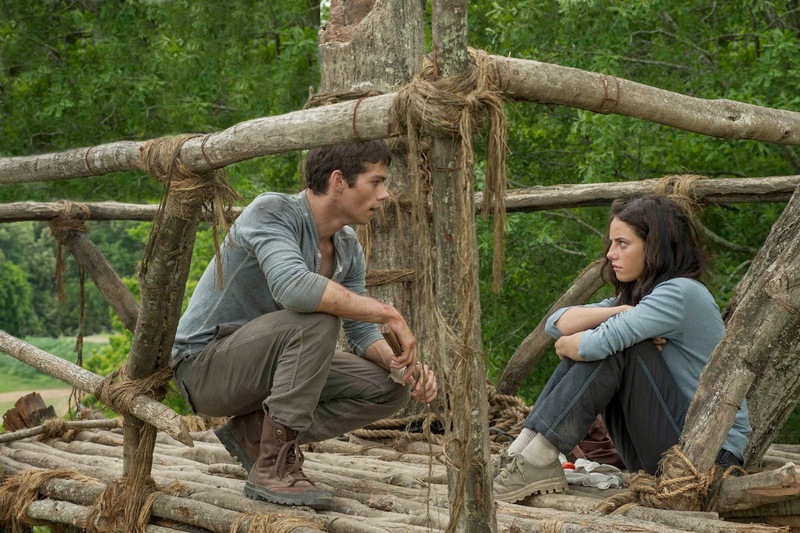 Thomas is first to gain the trust of Teresa (Kaya Scodelario) who may hold they key to his escape. The Maze Runner clocks in at just under two hours and it couldn't be a more brisk or enjoyably paced thriller as it hits all of the high notes we'd expect it to while turning a few of the scenarios on their heads so we aren't delivered everything as expected. Naturally, there is a strong tendency to lean toward the safe trappings of the genre to which this belongs, but ultimately the premise is so bear in its simplest terms and so intriguing on principle alone that we are willing to take the ride rather than be persuaded by the laws and rules of this particular universe that are trying to convince us it is different from the rest. In fact, what I almost appreciated more about the film besides the fact it easily elicited mystery from its surroundings was that it never brought so many details into the execution that we were questioning the logic. I've passed over countless YA adaptations simply because they seemed too much like another or asked too much of me up front while not delivering the entertainment value they should inherently possess in return. Divergent is especially guilty of this in the fact that I'd read the book, bought into the world but had a million questions concerning plot holes after seeing the film. I haven't read any of Dashner's novels in this series and so for me to come out of the film willing to accept the events without any qualms or major questions is a real sign of promise. Granted, it did seem the last ten or so minutes were rushed in a way that they tried to cram in too much exposition, essentially playing catch-up while in reality doing little more than setting up the sequel. Director Wes Ball, working on his first feature, could have just as easily strung out the somewhat underwhelming explanation for why these youths were left on their own to survive in a world controlled by the "royal they" over the course of the next few films instead of throwing everything at us at once, but this is likely to be blamed on the films three credited screenwriters rather than Ball who ultimately delivers a film not marking the beginning of the end, but rather what could be the real beginning of the YA revolution.